Highest torque in it's class. High Torque Cut-off Saw-Build a Dream Hardscape! As more people expand their living space into the outdoors, landscape/hardscape contractors need dependable and powerful tools to create a dreamscape for outdoor entertainment. ECHO’s CSG-7410 cut-off saw offers the highest cutting torque, one of the best air cleaning systems and more professional features giving contractors more power and durability for those tough hardscape jobs. Powered by a 73.5 cc 2-stroke professional-grade engine, the CSG-7410 provides more torque at the wheel due to a 2.6:1 drive ratio. High torque translates into a greater ability to cut through masonry blocks or concrete without bogging down. 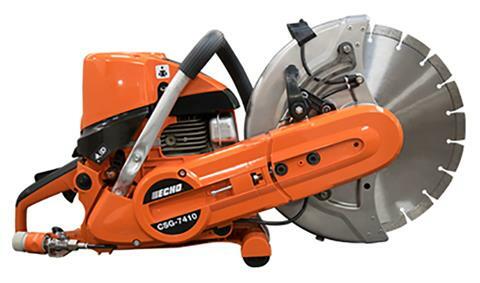 The saw also has a reversible cutting arm with a standard position for normal cutting and a reversed (outside mount) position to cut close to buildings or ground obstacles. The CSG-7410 is extremely easy to start due to the spring-assist starter, decompression valve, choke with automatic fast idle and purge bulb. The starter system is completely sealed. The patented 4-stage air cleaner system protects the engine for longer life. The CSG-7410 is packed with professional features and comes with a one year warranty, making it ideal for landscape/hardscape contractors. Four-stage air filtration system protects engine from harmful dust ingestion. Decompression valve for easier starter pulling effort. Momentary stop switch automatically returns to "on" position. Purge bulb provides fresh fuel to carburetor. Side-access belt tensioner for easy belt adjustment. Reversible cutting head can be moved to enable cutting near a wall or close to the ground. Aluminum handle with rubber grip for comfort and vibration reduction. Brass water valve controls flow of water. Quick release hose adapter to attach hose for water supply. Abrasive wheel included, diamond wheel sold separately. Arbor - 20 & 25.4 mm. Without wheel - 23.6 lb.